Answer: Total under roof is 2,284 sq.ft. Question: How was wondering how the joists would be arranged with a full basement? Answer: Design has I-joists for the floor system and they run front to back. Question: What is the ceiling height in the living room? Question: Where do the furnace and water heater go? Answer: Either out in the garage or in the attic for the crawl or slab options. 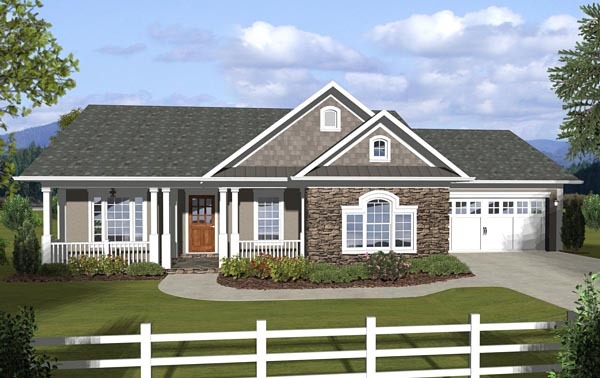 Question: The picture shows a siding and stone exterior. 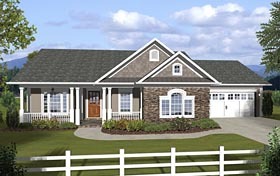 I want a stone façade body for the entire exterior of the home with siding only on peaks, does this require a modification? Thank you. Answer: The stone doesn’t require support if stone will be a cultured stone vs. stacked stone. If full stacked stone is used, a support ledge is needed at the foundation – similar to brick. This could also be done in the field if need be. But it does change the foundations dimensions, causing a greater opportunity for errors. Click Here to download a free PDF Brouchure of Plan Number 74845.